while peppering this post with photographs. I went in the late fall, though I’ve done the hike in the summer a while back. From what I remember, the water levels were fairly high back then – up to my chest at some points. It was also very busy with hikers. Going in the fall, the water levels were much lower, and most of the time I was only shin-deep in the river. There were a a few crossing where the water was much deeper. Hiking in the water is inevitable. Preparation is key. 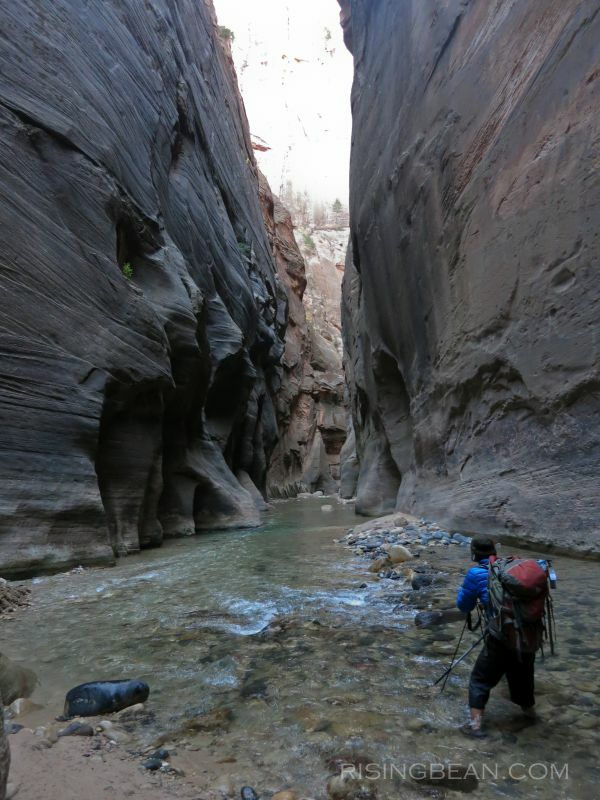 The first time I tried the Narrows, I was barely out of my teens, and knew nothing about the hike, or Zion National Park for that matter. In typical whirlwind fashion, I planned a one-day stop of Zion on my way to the Grand Canyon, which was a big mistake in hindsight, but the majestic drive through Zion was enough to convince me to return in the future. Back then, I foolishly didn’t want to get my shoes wet on the hike, so I walked in bare feet. Granted, the rocks in the river are smooth from the water flow, but lack of barefoot experience meant I couldn’t hike without substantial discomfort or risk of injury. This time around, even with hiking sandals on, I still got my share of cuts from the rocky river bottom. My partner did the hike reasonably comfortably in cheap water shoes from Walmart, and as mentioned, I wore hiking sandals. Don’t wear flip flops – they’ll keep falling off as you walk in the water, and there are sections where you’ll be walking in the water for a while. The best footwear can be hired from outfitters in the nearby town of Springdale. Alternatively, you can wear hiking shoes, but remember, they’ll get completely wet, shoes can take days to dry, and can potentially mold and stench if if they remain wet for too long. If you do the hike in the fall or winter like I did, the water is frigidly COLD. As you can see, I’m barefoot in sandals, but that’s because I gave my neoprene water booties to my partner, who couldn’t bear the cold water anymore. The photos don’t show it, but I’m not a happy camper. I’d say neoprene booties are the absolute minimum gear requirement for a cold water fall hike. You’ll probably find out with 5 minutes of drenching your feet in the river whether the water is too cold or not. Hiking with uninsulated feet was seriously uncomfortable for me, and I considered turning back several times at the start of the river hike. Miraculously, however, my feet adapted and became numb to the water temperature after 30 minutes had passed, and I was able to continue. Regardless, I wouldn’t recommend anyone going through that kind of suffering when proper footwear can be hired nearby. You can also hire dry bottoms or a dry suit if you don’t want to get wet at all. With the proper gear, you can take your mind off the cold and wetness and focus on enjoying the hike instead. Besides proper footwear, hiking poles also help maintain your footing as the river bottom is uneven at times, while the river flow will threaten your balance. Used properly, the hiking poles will actually propel you and help you complete the hike faster and with less energy expended. 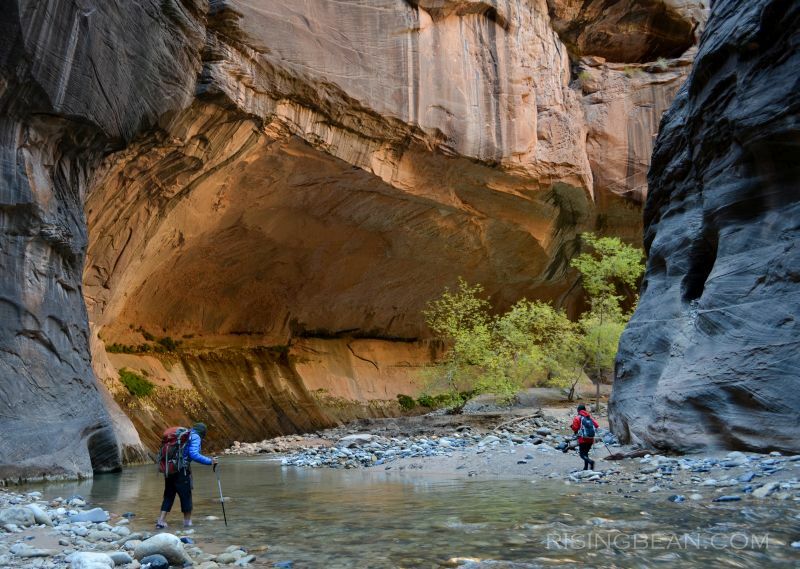 At the minimum, go in with any hiking stick, especially if you’re carrying a camera. 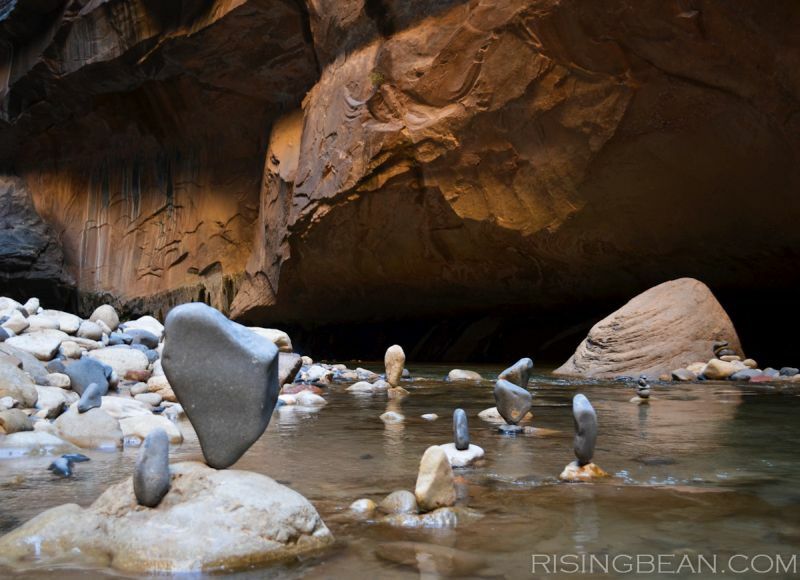 They’re also useful for some of the more strenuous hikes in Zion, such as Angel’s Landing. 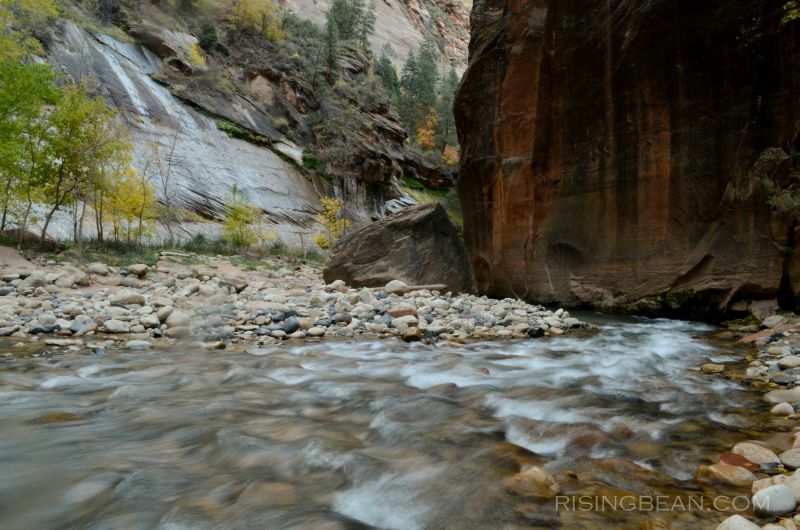 As you can see, the Zion Narrows are pretty damn scenic. There were several photographers on the trail, all carrying heavy tripods with equally heavy SLRs. In my opinion, a tripod is pretty important to bring along, even if it’s just a tiny one to balance on dry rocks. The lighting in the Narrows is relatively low, so you don’t want to come home with shaky or blurry photos. I carried a rather flimsy ultralight tripod, since my focus was on getting deep into the canyon, so I had to be more careful with my tripod placement. I was also carrying video equipment since that was my primary focus. However, to be honest, I don’t think camera gear weight saved that much time, since there wasn’t any elevation change. Like I mentioned, I think proper footwear would have made the most difference. Still, a tripod was nice to have as it allowed me to take long exposure shots, giving the running water a smooth, silky appearance in my photos. A strong, sturdy tripod is useful since you can set it up in some of the calmer parts of the river for some really nice photographs. I also recommend bringing an extra sweater or thermals. 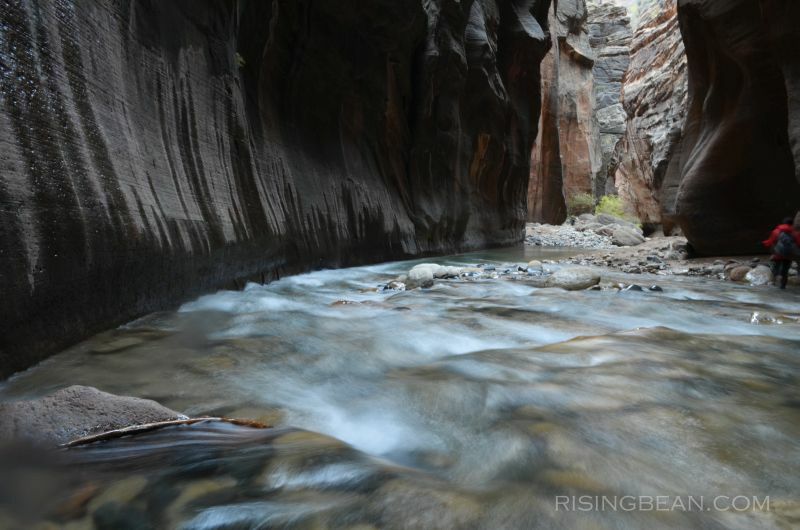 One might be fooled by the sunny exposure at the parking lot and Riverside Walk entry hike, but once you approach the river entry point, the canyon narrows quickly, sunlight disappears, and you’ll feel a cold draft immediately. I started the hike in a light sweater and t-shirt, but midway through the hike, I was wearing all the layers I brought with me. I stopped at Orderville Canyon, since I was out of time and it was getting dark. It’s about the half way point to as deep as you can go, and a nice place to stop, since it’s at a canyon junction. A canyoneering route finishes with a rappel somewhere around here, so it’s something I might try the next time I go. 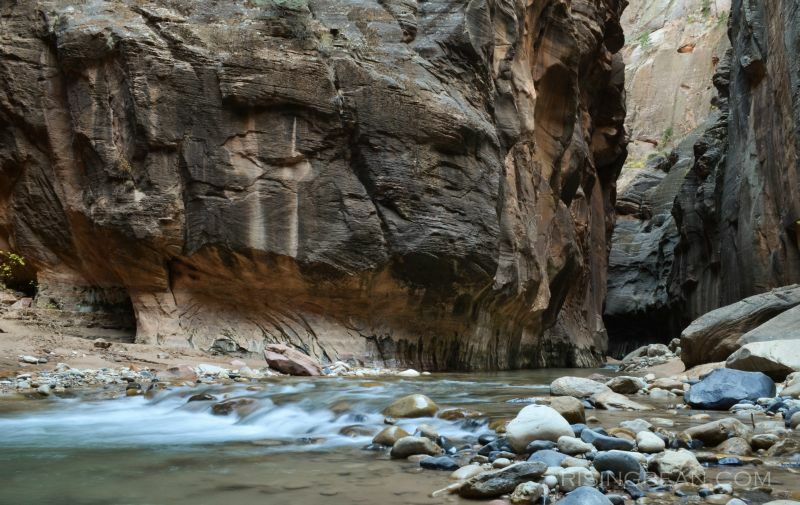 That’s one of the great things about Zion National Park – there are so many adventures packed within making revisits worthwhile. Orderville Canyon wasn’t my favorite section though. I liked the below photographed section the most, because as I entered it, the afternoon sun hit the canyon wall, giving it a beautiful orange glow. 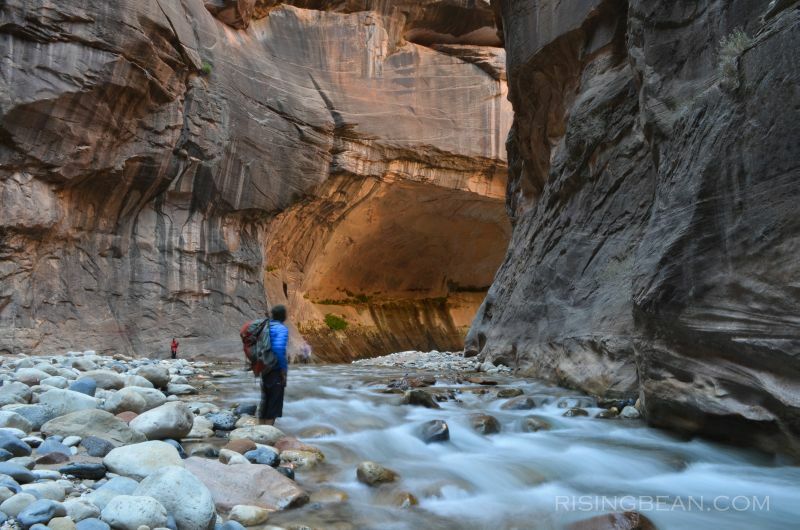 What’s most amazing about the Zion Narrows is how massive it is compared to other slot canyons I’ve visited. Looking at pictures with people in it, you get a glimpse of the sheer enormity of the canyon. The crazy part is, the photos only capture a small section of the canyon, not even coming close to showing the full height. I think the hike to the end of the Narrows and back would take somewhere in the realm of 8-10 hours, but I preferred spending the time taking photos, making videos, and enjoying the scenery. If you go, make sure you keep track of the time, and always bring along a headlamp for day hikes. I left a little late and came out in the dark. It was a little fun as I hiked in solitude, but without a headlamp, it’d probably be a nightmare negotiating a river in the dark. 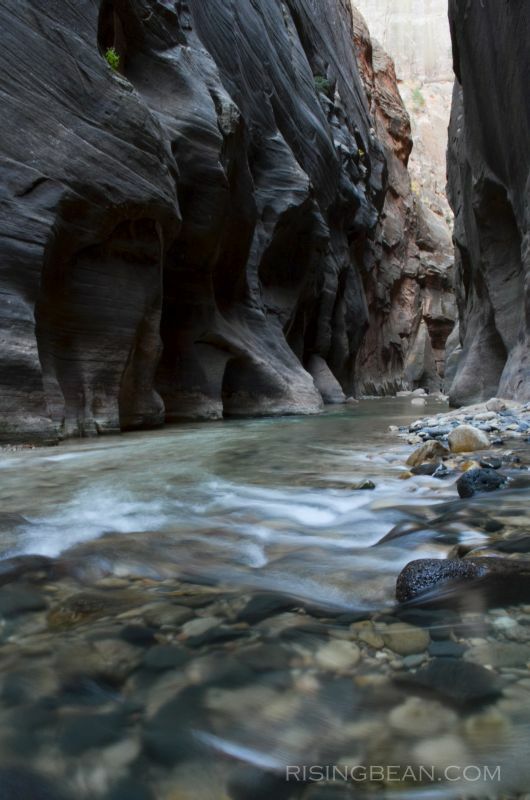 The Zion Narrows isn’t a particularly strenuous hike, like the hiking map suggests. It’s only difficult if you go the whole length. However, because I was setting up video shots and combating the cold water, I was pretty devoid of energy that evening. 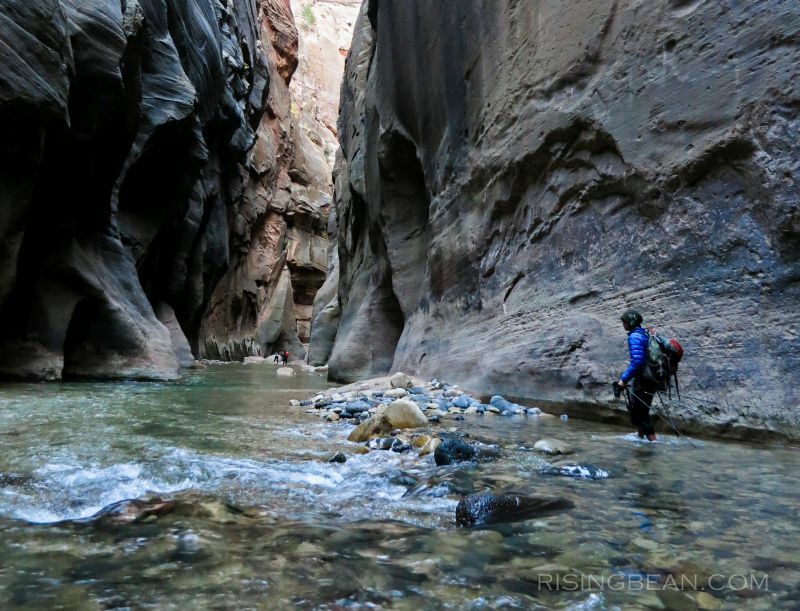 And yet, I went to bed excited, knowing there were so many more adventures to come – beautiful hikes, epic rock climbing, and my first foray into canyoneering lay ahead.